The content drilldown section within Google Analytics shows the taxonomy of your site, what the organization looks like, and where people interact on your site. 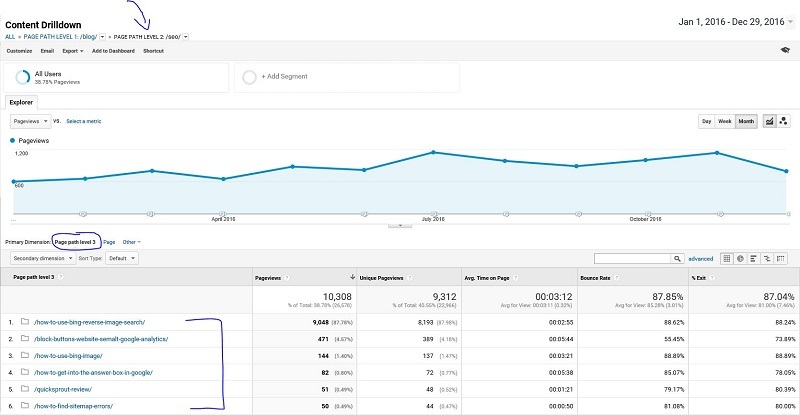 Within this report, you can see how many page views a URL gets, the bounce rate, the exit rate, and the time spent on the page. This report can help you see if there are sections on your site that are working. You can also notice if you have duplicate content on your site that competes with other pages on your domain. You can break out the report by medium and source to see how your audience reacts when coming from a different avenue like email over organic search. Let’s learn how to use this tool now! What is Content Drilldown in Google Analytics Meaning? Think of content drilldown as a high-level view of the organization of your content. You can use this report to see where the flow of your site is confusing users from their landing page visit. For example, you can see where your audience as a whole responds better to page A and not page B that covers the same topic. At a high level, this is the breakdown of my site so far for 2016. As you can see, the blog receives the most amount of traffic by design. Since the goal of my website is to drive users to the blog, I can confirm from a site content perspective I am achieving my desire. With the picture above, I click on the blog section to expand it to see what pages bring in the page views. As you can see below, I am at the path level of my blog, but I can look at a high level how all of the content lives and the page views that it brought. As a note, you can include the full URL to see everything if that makes reading this report more manageable. What you can do from here is click on the page path level 2 and explore the URL’s that live under the page level 2 path. Technical SEO opportunities are the key to SEO success. This report can give you high-level insight into discovering thin content, duplicate content, or pages that are spreading your SEO efforts all over the place. This report can help spot dead pages that are on your site that bring in page views. I suggest downloading this report and use Screaming Frog to find 404 errors on your site. From there, you can create a VLOOKUP in excel and see if there are pages that need to be clean up. Spotting areas of opportunity are achievable by using the second dimension section in Google Analytics and include the title tag. By doing this, you can see what pages have a similar title tag as another page that is in your domain. What is fantastic is that you can see title tag changes that you made in the past and measure how they perform against each other. You can use the advanced search section and search for a keyword that lives in the title tag. You can then see how many pages cover the same (or similar) topic and then make the call on what you should do next with them. One strategy you can consider is 301 redirecting related content to one central page to drive up the SEO value and potentially rank for more terms. The Content Drilldown report in Google Analytics, in my opinion, is a hidden gem. Users will flow from a page to another page if the taxonomy of the site makes sense. The same can be said for search engine bots when they crawl through a website. Making sure you have a clean path will have a positive impact on your audience and your SEO. I would even take this a step further and use the index explorer tool within Bing Webmaster Tools to see how Bing bot sees the taxonomy of your site. If you are looking for a more in-depth drive, you should look into log file analysis for SEO to see what Google and Bing see on your website. You should also consider the traffic sources of which users are coming to your site from. Reviewing the conversion rates of your top pages can also unlock additional opportunities from your analysis. Users may also being using your site search, so you can use these reports to create new content to match the consumer’s need. 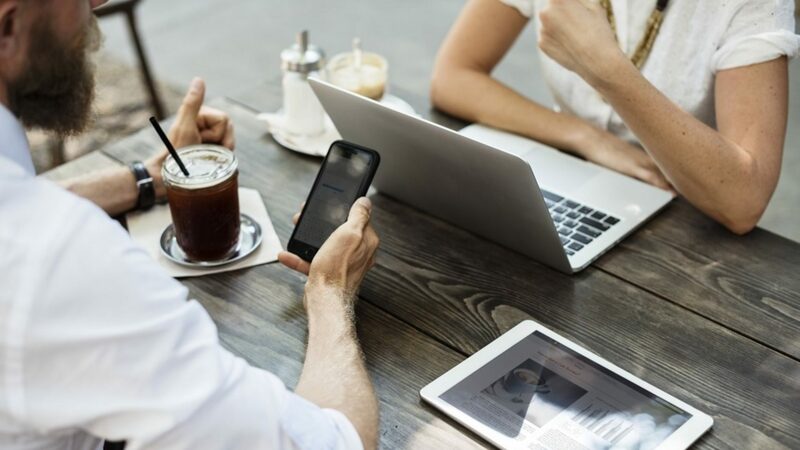 Google Analytics reports jam pack a lot of information in them, but this report can give you the additional insight to improve your overall conversation rate for your website. Finally, you can use this report outside of SEO. For Your Google AdWords or AdSense accounts, you can see where people are dropping off. If your goal is to get people to fill out a form on a site, you need to see where the exit pages are in the report. If the goal is to have a lot of page views on your site, you can use the content drilldown report to see if you need to create additional paths for users to take to discover new and relevant content. I’m a Boston SEO Expert who can help with this analysis too.